Eco-friendly mini-Kraft Gable Boxes are the New Rave! So you're engaged and the planning has started. There are so many decisions you'll have to make over the next several weeks and possibly months - the venue, DJ, wedding planer, florist, caterer, invitations, bridesmaids, etc. Also at the top of the list are wedding favors for your guests. A new trend among environmentally-conscious brides is choosing favors that are eco-friendly. 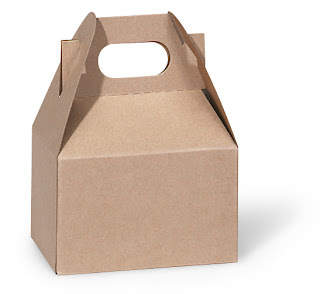 Kraft gable boxes will allow you to package your favors in a box that's safe for the planet. These mini-boxes can also be used to house all sorts of items and treats for your bridal shower, bridal luncheon, rehearsal dinner, wedding reception or special occasions. You can glam your special day with these practical Kraft gable boxes. Whether your wedding theme is classic beauty, retro, rustic, funky or traditional, gable boxes will enhance your style and your guest will simply love them. Okay, let's face it, selecting just the right wedding favors can be stressful, but it doesn't have to be - especially if your selection is functional and affordable. Kraft gable boxes work well whether your wedding is planned to take place at a chapel, in a garden or at the beach. These tiny boxes are excellent packaging for candies, chocolates, wedding favors and party treats. Our mini-gable boxes measure 4 X 2.5 X 2.5. 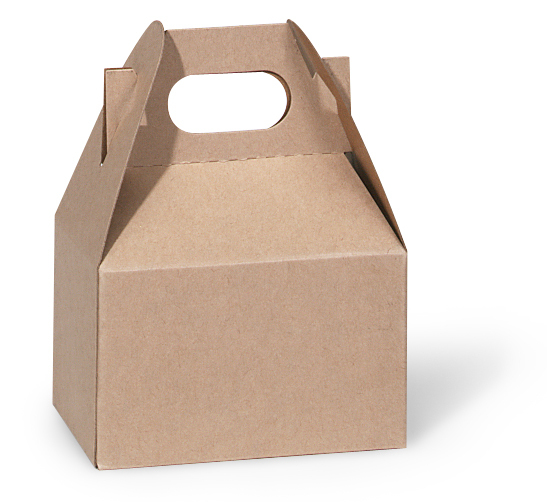 The Recycled Kraft favor boxes are available in packs of 100. Our unique gift boxes meet FDA requirements for direct food contact. Add ribbon to the handle for special touch. Enhance your gift with personalized labels, personalized tags or personalized stickers. Selecting favors should not take over your life and turn you into a bridezella. To ensure this doesn't happen we suggest using mini-Kraft gable boxes because they are fashionable, affordable and unforgettable. 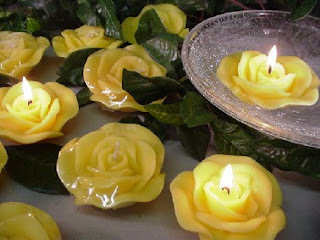 Sassy Floating Rose Wedding Candles are Fun Favors ! Floating rose candles are ideal mementos and allow you to breathe a little easier when choosing accessories for you next party scene or celebration. Candles are great as DIY wedding favors because they allow for immense creativity and unique expression to show and share your true personality. Floating candles are budget-conscious “thank you” favors and gifts, particularly when escalating cost is a concern for the wedding couple. 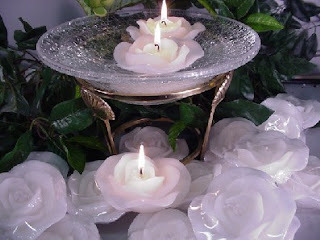 The elegance of these floating candles will liven up your celebration and compliment your theme. Great to hand out as party favors for your guest, floating candle favors shaped like roses - whether scented or unscented will be cherished by all. Each is individually wrapped and make a clean, crisp presentation. Each candle burns up to 5 hours on dry surface, a little less in water. They are available unscented or lightly scented with floral fragrance oil and measures 3". Pink Roses or Peach Roses symbolize Gratitude, Appreciation, Admiration, Sympathy. Yellow Roses symbolize Joy, Gladness, Freedom, Friendship. White Roses symbolize Reverence, Purity, Innocence, Secrecy. A palette of several colors, candle favors are perfect for wedding rehearsal dinners, bridal showers, wedding receptions or just about any special occasion where simplicity and beauty are desired. Add them to your place setting with a small note card or personalized tag penned with a crafty message. A thoughtful way to add illumination and whimsy to your eventful affair, this unique wedding favor has a long-term use. Every time your guests light their floating rose candle they'll remember your wonderful celebration. 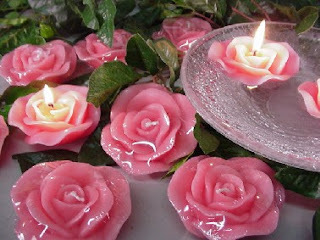 So, if you're looking for unique favors that will have a lasting impression, these unforgettable floating rose candles are sure to please!